In this blog ,I will describe the steps for setting up a distributed, multi-node Hadoop cluster running on Red Hat Linux/CentOS Linux distributions.Now we are comfortable with installation and execution of MapReduce applications on Single node in Pseudo-distributed Mode. [ Click here for the details on single node installation ].Let us move one step forward to deploy multi-node cluster . Hadoop Cluster is designed for distributed processing of large data sets across group of commodity machines (low-cost servers). The Data could be unstructured, semi-structured and also could be structured data.It is designed to scale up to thousands of machines, with a high degree of fault tolerance and software has the intelligence to detect & handle the failures at the application layer. - The ResourceManager negotiates the necessary resources for a container and launches an ApplicationMaster to represent the submitted application. Major part of cluster consists of Slave Nodes to perform computation . The NodeManager manages each node within a YARN cluster. The NodeManager provides per-node services within the cluster - management of a container over its life cycle to monitoring resources and tracking the health of its node. Container represents an allocated resource in the cluster. The resource Manager is the sole authority to allocate any container to applications. The allocated container is always on a single node and has unique containerID. It has a specific amount of resource allocated. Typically, an ApplicationMaster receive the container from the ResourceManager during resource negotiation and then talks to the NodeManager to start/stop container. Resource models a set of computer resources. Currently it only models Memeory [may be in future other resources like CPUs will be added ]. 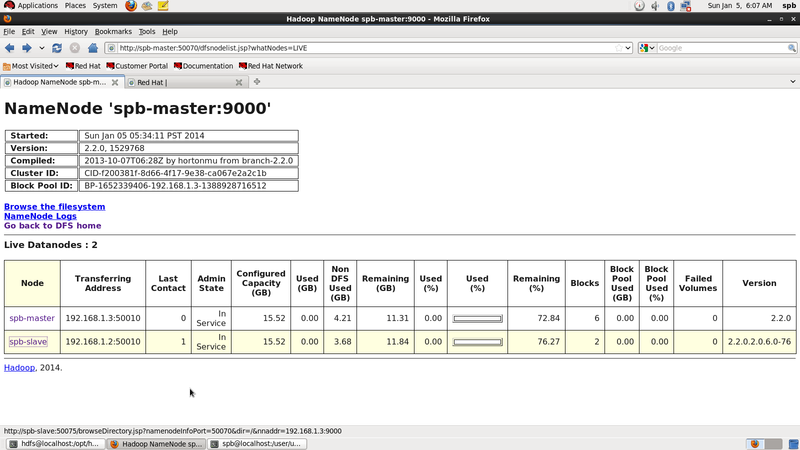 My Cluster setup has single master node and a slave-node . 1] Lets have 2 Machines (or two VMs ) with sufficient resources to run MapReduce application. 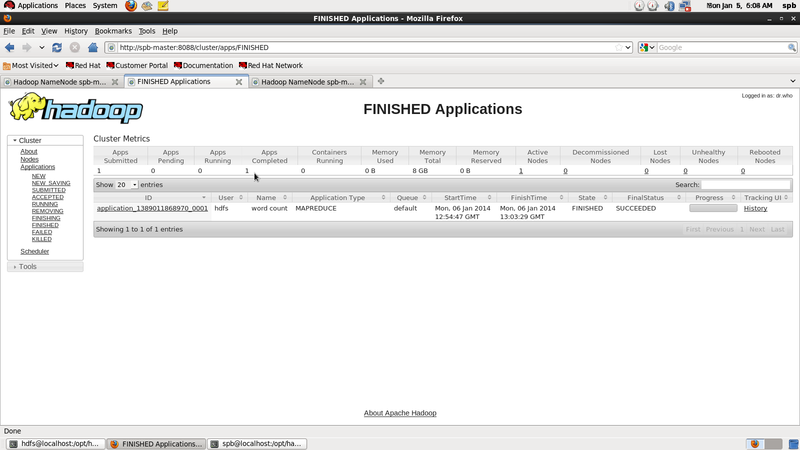 2] Both machines are installed with hadoop 2.x as described in link here. 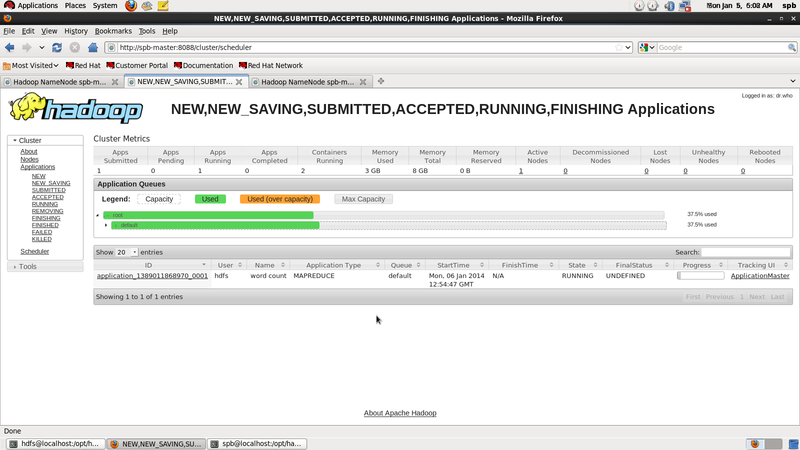 Keep all configurations and paths same across all nodes in the cluster. 3] Bring down all daemons running on those machines. Step 1: First thing here is to establish a network between master node and slave node. Assign IP address to eth0 interface of node1 and node 2 and include those IP address and hostname to /etc/hosts file as shown here. 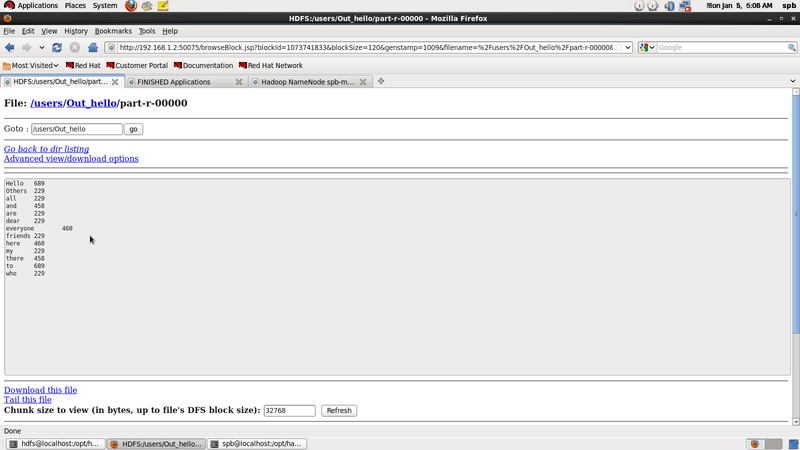 Step 2 : Establish password-less SSH session between master and slave nodes. Now both Machines are almost ready and communicating without prompting for password . 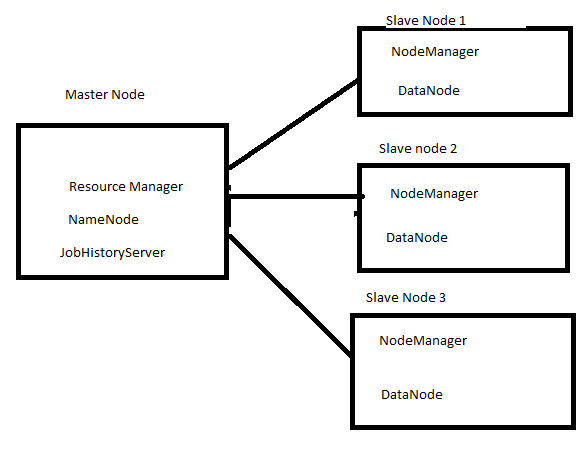 HADOOP_PREFIX/etc/hadoop/slaves file should contain list of all slave nodes . NOTE: Here setup configured to have DataNode on master also (dual role). 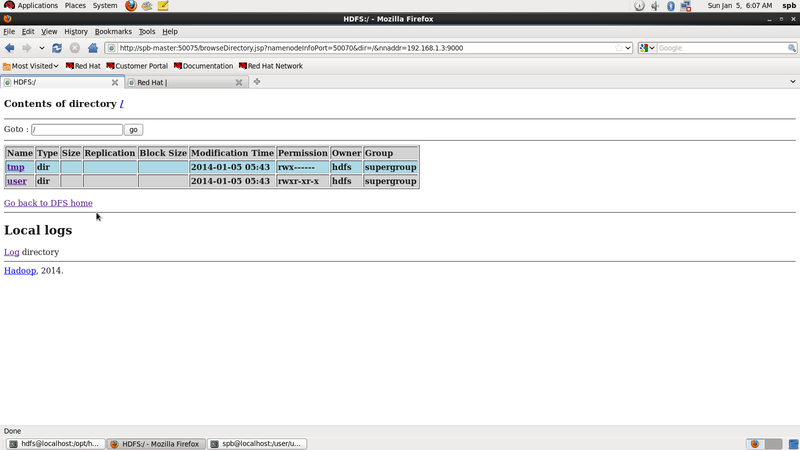 Step 4 : Other configurations remain same as copied below across all the nodes in cluster. Step 5 : Format the Namenode . 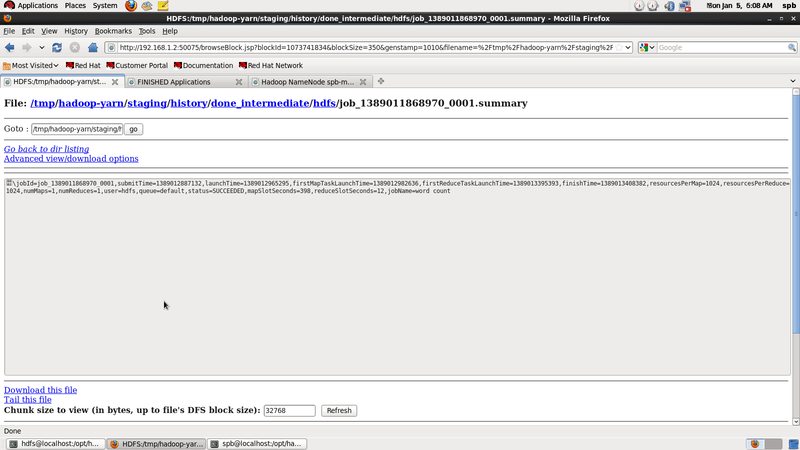 14/01/04 05:34:45 INFO common.Storage: Storage directory /var/data/hadoop/hdfs/nn has been successfully formatted. 14/01/04 05:34:45 INFO namenode.FSImage: Image file /var/data/hadoop/hdfs/nn/current/fsimage.ckpt_0000000000000000000 of size 196 bytes saved in 0 seconds. Pictorial representation of a YARN cluster[Click here for Source]. 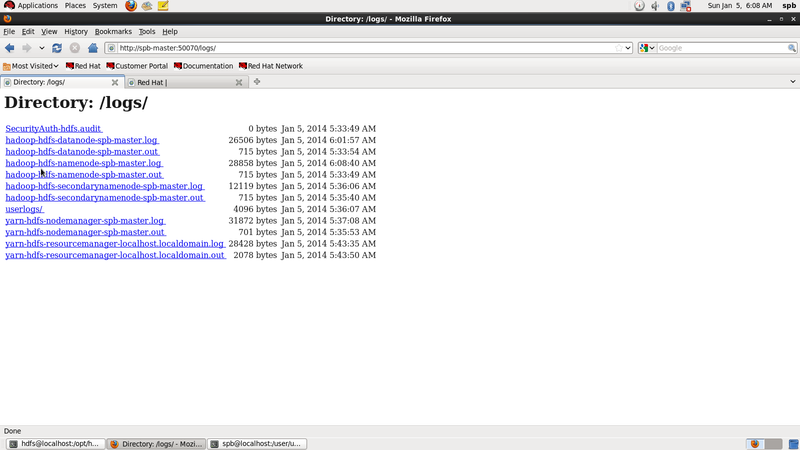 Step 11: Check the logfiles for successful launching of each daemons . WordCount example reads text files and counts how often words occur. The input is text files and the output is text files, each line of which contains a word and the count of how often it occured, separated by a tab.Each mapper takes a line as input and breaks it into words. It then emits a key/value pair of the word and 1. Each reducer sums the counts for each word and emits a single key/value with the word and sum. 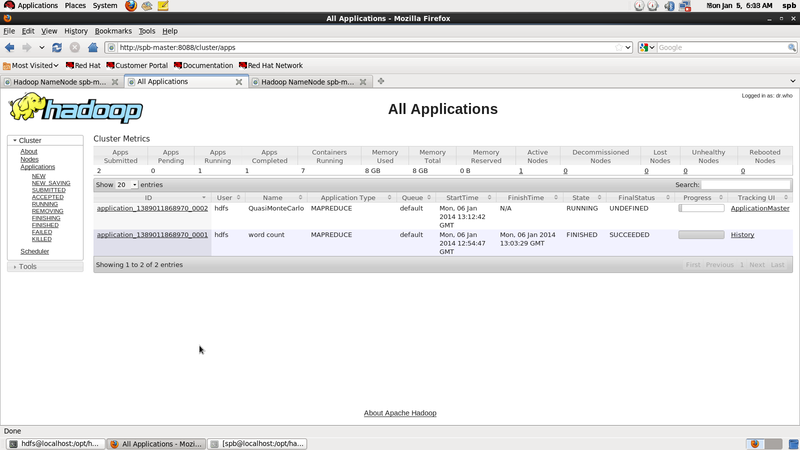 Step 15:Web Interface to view the running application on cluster. Step 19:Run another sample application program "pi" from hadoop-mapreduce-examples-2.2.0.jar and view the status "RUNNING"
Step 20: List of default PORTs for each components of Hadoop Ecosystem . Similarly you could find lots of information about WI ports, default port at http://docs.hortonworks.com/HDPDocuments/HDP2/HDP-2.0.5.0/bk_reference/content/reference_chap2.html.This would clarify your doubts on using the port numbers in Configuration Files. Click here : Single-node Cluster setup and Implementation. Click here : Big Data : Watson - Era of cognitive computing !! !